Over the past decade or so, the subcompact car has grown to be one of the most popular and competitive segments in the automotive market. More and more drivers are looking for cars that offer great fuel economy at a low price, and the subcompact car specializes in that. With so much driver interest, automakers have flooded the market with their own models all claiming to be the best. But, which actually stand out? That's what we're here for! We create these model research pages so that drivers can learn about some of the most popular models in the most competitive markets in a simple and concise way. For this page, we're going to be examining the 2018 Kia Rio, one of the most popular subcompacts available today. Let's see what this spunky little car has to offer! No better place to start than underneath the hood! The 2018 Kia Rio comes standard with a small, but punchy, 1.6-liter inline 4-cylinder engine. This engine may not be big, but it's still got a kick to it, giving drivers up to 130 horsepower and 119 lbs.-ft. of torque. And, it's as efficient as any, getting an EPA-estimated 37 mpg highway! One thing that Kia always strives with its cars is making them as valuable and affordable as possible. The 2018 Kia Rio may be its biggest achievement in that regard yet! The 2018 Kia Rio comes with a starting MSRP of just $13,900! Thousands of dollars less than other competitors like the 2018 Honda Fit or 2018 Chevrolet Sonic. The 2018 Kia Rio is more than just an efficient little car, it also features some of the most advanced technology features available today. Like Apple CarPlay and Android Auto which allows smartphone users to integrate all their favorite music and some of their favorite apps right into the infotainment system interface of the Kia Rio! Test Drive the 2018 Kia Rio at Citrus Kia in Spring Hill, Florida, Today! As great as all those features and specifications may be, they don't matter much if the car isn't also safe. That's why the 2018 Kia Rio also comes with some of the most advanced safety features and driver-assist technologies. Like the Forward Collision Warning System that offers audible and visual alerts if it detects hazards in your path. Or the Autonomous Emergency Braking system that automatically will apply the brakes for you if it senses an imminent frontal collision. 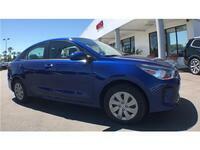 Want to learn more about the 2018 Kia Rio? Ready to get behind the wheel of one? Contact our staff at Citrus Kia for more information or to schedule a test drive today!